With more than 800 miles of coastline stretching from Mexico to Oregon, the Golden State has its share of beaches. 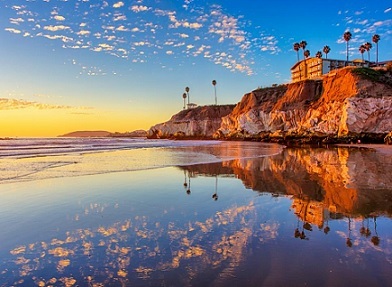 Known for its surfing and breathtaking sunsets, California has more than 900 beaches along the Pacific coastline. Finding your own secluded spot on the sand can be challenging. Here is a short list of the best California beaches. Whether you choose to spend your day surfing, sunbathing or walking, hopefully one of these will have the perfect combination of privacy and paradise you seek. Natural Bridges is an oasis of natural beauty. The rock formations on the beach are an excellent vantage point for viewing shore birds, migrating whales, and seals. There is a creek that flows through the park, forming freshwater wetlands; also there are grasslands with bright native wildflowers in the spring. If you want more, every year in the late winter or fall, thousands of Monarch butterflies migrate there each year. If you desire to visit a beach and see nature in all its glory, consider a visit to Natural Bridges Park. 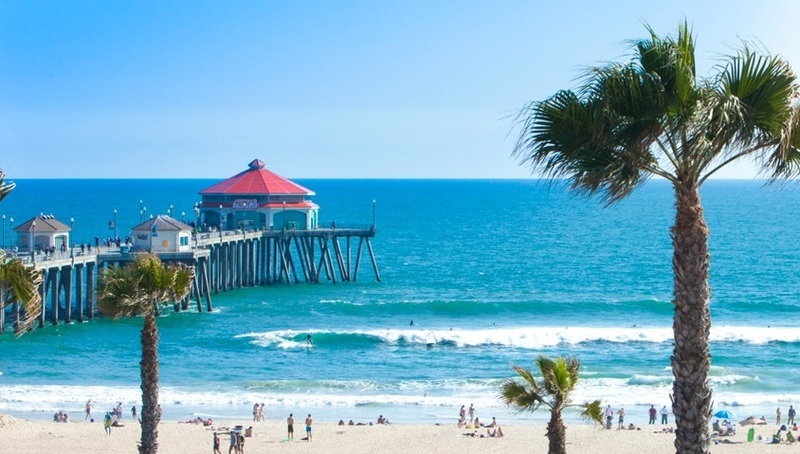 Huntington Beach (a.k.a., Surf City USA) is home to the International Surfing Museum and the US Open of Surfing. With its three miles of shoreline, this beach is popular with volleyball players and surfers. There are also restroom facilities, showers and food stands. For those that want to bring their dogs along, they are permitted in the pet friendly area. If you are a biker, take a ride on the scenic Huntington Beach Bike Trail. Malibu is known for its beaches; one of the best is El Matador State Beach. Located among the mansions of Malibu, El Matador is worth a visit for its tidal pools, caves and coastline. Once you arrive at the beach, you will follow a steep trail and take the stairs down. Once you get to the bottom, you will be greeted with sand, sea caves and large rocks. Although there are restroom faculties, there are no dining facilities. Venice Beach is unique among the beaches of the world. Sure other beaches have sand and surf but no other beach has the activity & energy of this place. Venice boasts a mile-and-a-half-long boardwalk that has stores, food vendors, flea markets and various street performers. If you want an alternative to your typical beach day, remember Venice Beach. Newport Beach offers lots of room for you to enjoy yourself. This beach has a number of activities including: skating, bike riding and surfing. In reference to biking, there is a lengthy bike trail that extends around most of the peninsula. Riding the trails is a great way to check out the surrounding area. When the sun sets, an option is to enjoy a night of casual or fine dining. Lastly, with the year round climate, Swimming and Sunbathing are popular. 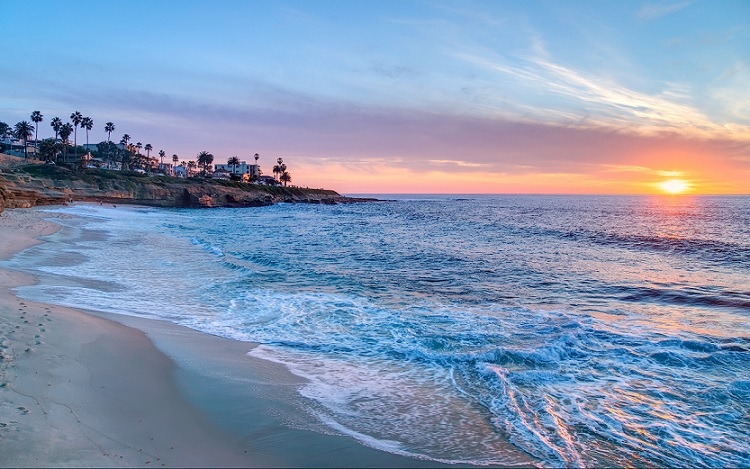 Located in San Diego’s Ellen Browning Scripps park, next to towering sandstone cliffs, La Jolla Cove is one of the smaller beaches and one of the most photographed too. This beach has a tide pool at low tide and a cave to climb through; also, LaJolla has a group of harbor seals that can be photographed. For the snorkeler the water has a 30 foot visibility, making it ideal for scuba-diving and snorkeling. Another popular beach is Coronado Beach. Located across the bay from San Diego, this beach has clean sands and a peaceful atmosphere. Coronado is a Spanish word for “crowned one.” Thus the nickname The Crown City. One popular way of exploring the area is via bike trail; the trail will take you around the perimeter of the Coronado peninsula; this will give the rider great views of San Diego on one side and the beach on other side. 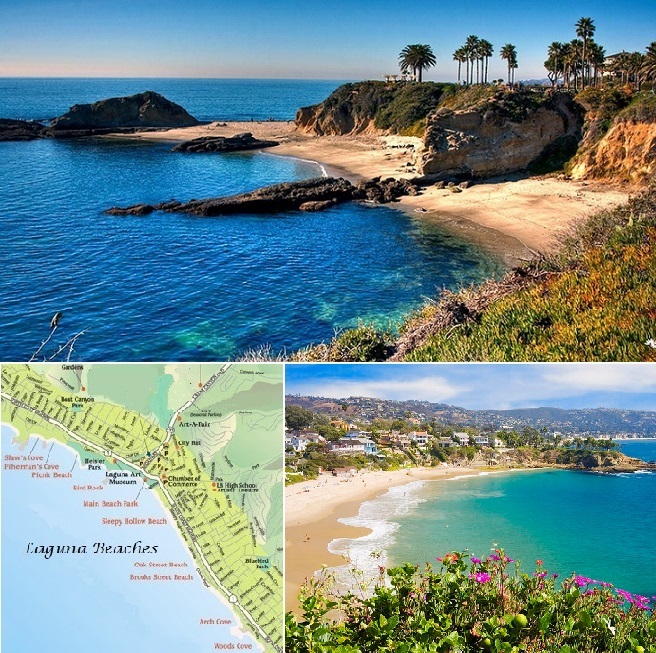 Located between several miles of hidden coves and canyons, Laguna Beach is a popular year around destination for the beach-enthusiast. This area is also a retreat for art lovers, outdoor enthusiast and of course beach-goers. There are more than twenty beaches in this area; some of which include: Crescent Bay, Main and Thousand Steps Beach. If you enjoy beach-hopping this is the place for you. There is never a shortage of excitement at Santa Monica: this 245 acre shoreline is popular with beach-enthusiast and thrill-seekers alike. Visitors will find a boardwalk, amusement park, playground, bike-riding and walking paths. If all this is not enough, there are gorgeous sunsets and views of the Santa Monica Mountains. If you desire the festive atmosphere of a beach & amusement park with aquarium wonders & festival food, remember Santa Monica Beach. Catalina Island is located 22 miles off the southern California coastline; this island is known for its diverse wildlife, mountains and blue waters. Among the few beaches found there, the most popular is Descanso Beach; this is part of the Descanso Beach Club and for a small daily fee you can enjoy a visit there. Other attractions on Catalina include: horseback riding, kayaking, hiking, snorkeling and scuba diving. For your evening activities you could take a walk around Avalon for some shopping or enjoy a gourmet meal. If Catalina Island sounds intriguing, the Catalina Express departs from Long Beach, San Pedro and Dana Point on a daily basis; travel time is roughly an hour. Carmel beach is located on the central California coastline; this white sand beach is renowned for good surf and excellent dog-walking conditions. For the nature-enthusiast, the Scenic Bluff Path is a gravel pathway that meanders through the shade of Monterey cypress and landscaped gardens; this provides an excellent place to walk your dog or just to enjoy nature. This beach is also popular with Volleyball players; with Monterey Bay National Marine Sanctuary as a backdrop, makes for a beautiful place to play the game. Carmel Beach is also popular for weddings too. When visiting please be aware wading along Carmel Beach is permitted; just be aware there are no lifeguards on duty; the rip currents or sleeper waves can be unpredictable. Known for its abundance of outdoor activities, Hermosa is the go to place for a variety of activities. Hermosa Beach is located between Manhattan and Redondo Beach in southern California. This 1.5 mile stretch of sand is popular among volleyball-enthusiast; from professional to amateur, the flat beach makes Hermosa one of the most popular places for the game. In fact, Hermosa is home to the AVP Hermosa Beach Open Tournament. Other popular activities include: surfing, swimming and paddle-ball. There is a paved path that is used for walking and bike riding it is called The Strand. By day, it is a thoroughfare for bikers, joggers and strollers. At night, it is a great place to people-watch, as the crowds head towards the restaurants and bars in the Pier Plaza. With the scenic pier, paved oceanfront walking path and various activities going on, Hermosa could be your choice to experience the laid-back surfer lifestyle.